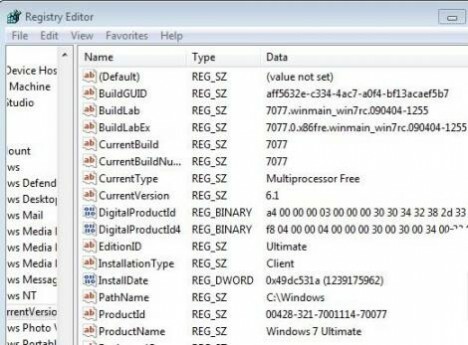 A build of Windows 7 which possibly be the official release candidate (RC) for Windows 7 has been leaked to Internet, although currently available for 32-bit (x86) edition only. Word is that Windows 7 build 7105 will be released as the Windows 7 RC, which is not just the escrow, but the final RC build. And there is high chance that Windows 7 Build 7077 will be rebrand and re-tag as Windows 7 Build 7105 to release as the release candidate for marketing purpose. Apparently, the version or build number of some components of Windows 7 Build 7077 has been appended with win7rc keyword, making the full string of winmain.win7rc.090404-1255. Previously, in build such as 7068, only winmain with major and minor build milestone is attached. Windows 7 Build 7077 has the build number of 7077.0.090404-1255, which means it’s been code dropped on April 4, 2009. If the rumor that Windows 7 build 7077 will be rebranded as 7105 is true, the official Windows 7 Release Candidate will be 7015.0.090404-1255. However, there is rumor that the final RC of Windows 7 will have the file name of 6.1.7105.0.090404-1235_x86fre_client_en-us_Retail_Ultimate-GB1CULFRER_EN_DVD, with build version 6.1.7105.0.090404-1235, slightly different from the leaked build 7077. 64-bit (x64) Windows 7 Build 7077 is available too. Update: Windows 7 RC Build 7100 is available for free download. Windows 7 Release Candidate (RC1) is expected to be officially released to public in May 2009. 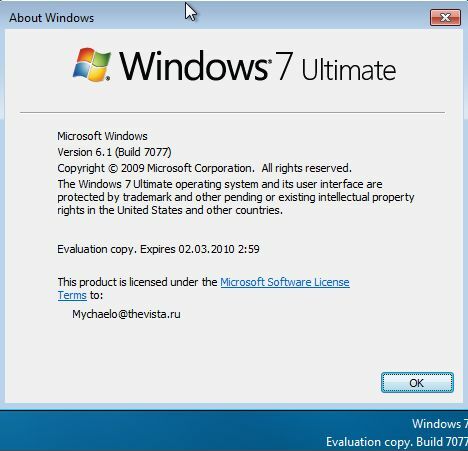 Good news is, the ISO image of Windows 7 RC, which is said to be build 7100 has been leaked to Internet.